1941 J. Burns Moore photo WFL parade drum print ad. 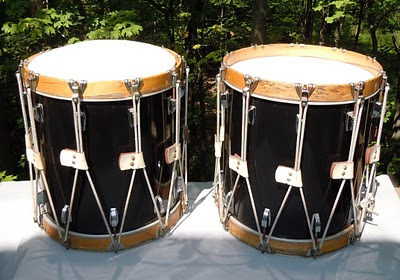 I found these on eBay and spoke with the seller, a by-appointment-only private retailer of professional percussion equipment. To say the least, the drums are interesting and different. Authentic custom-made 16X16" Ludwig 1976 Rope-Rod Snare Drums, featuring wood hoops, decorative rope & leather tension similation and Ludwig PA Parade white plastic heads, top and bottom. 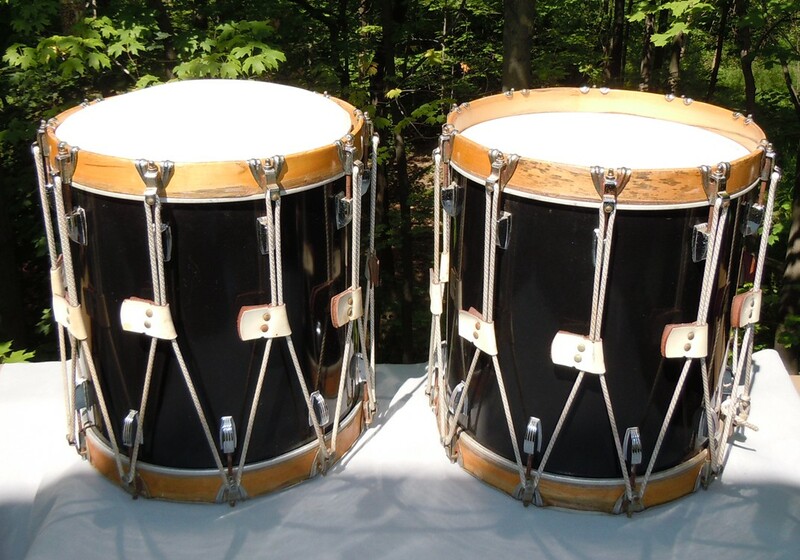 These are identical drums designed from 1976 Ludwig production of their USA 200 Year Centennial, limited edition series. Mahogany shells are covered in Black Cortex. These four drums come with detachable white padded cushions, therefore allowing the drums to be used as comfortable decorative drum stools ... or actual snare drums [but you'd need to install snares and snare mechanisms]. Snare mechanisms have intentionally never been mounted on these drums, as they have been used exclusively as decorative drum stools. The drums have never been played. Shells, wood hoops, rope and leather are in very good condition. There is a little corrosion on the tension rods and a few plating pimples on the lugs. This is more than a conversation piece, these are real Ludwig Bi-Centennial 1976 drums made in Chicago. ASKING PRICE: $1,000.00; Can be picked up in Cleveland, Ohio or UPS-Ground Shipping charges to be determined based upon geographic location of customer. ALSO AVAILABLE: Matching Ludwig Vistalite Conference Table/Game Table. 48" diameter multi-color transparent table top, mounted on 30" diameter black & white Vistalite bass drum with chrome lugs. Table also includes internal lighting to illuminate the entire drum sides and top. This is a custom made one-of-a-kind table. QUESTIONS AND INQUIRIES TO: Direct contact to: perclady1@aol.com.